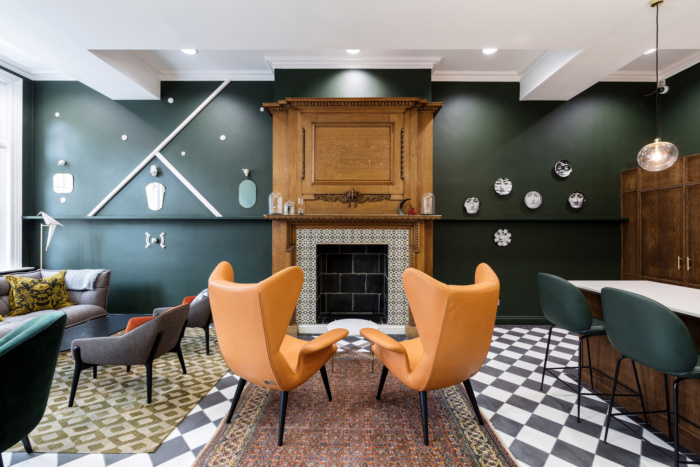 Kinnersley Kent Design designed the the Central Working Victoria coworking offices located in London, England. Leading shared workspace provider Central Working has launched a new co-working hub for innovation and enterprise within Grosvenor Britain & Ireland’s new Eccleston Yards development, on the boundaries of Belgravia and Victoria in central London, UK. With interiors by Kinnersley Kent Design, one of London and Dubai’s most prestigious design studios, the new hub anticipates the needs of the modern startup community with an all-inclusive hospitality-first approach. Central Working Victoria is the anchor tenant of Eccleston Yards, which brings together food, fashion, retail, co-working and wellbeing. Central Working Victoria is designed to host over 500 entrepreneurs and businesses of all sizes within a refurbished Victorian electrical substation. Catering for a group that rarely conforms to a nine-to-five routine, a chill out room is available to provide rest and relaxation, as well as a 70-seat auditorium to accommodate visiting lecturers from the tech and creative industries. The 25,000 sq ft space is split across three levels, and features flexible work areas including drop-in desks, private offices, phone booths for private calls, a members’ lounge, and a variety of meeting spaces from boardrooms to huddle rooms. Central Working Victoria is one of the latest sites designed by Kinnersley Kent Design in partnership with Central Working. Other recently completed sites including Reading and Slough, with more coming soon.